How does a woman shop online? If she feels her arms are bulky, she will trawl the web for sleeve styles that make them look slim, and then search for similar products on fashion e-tailers. Subsequently, there will be discussions with friends and sisters on whether the shortlisted pieces will be able to hide the difficult-to-lose bat wings. Replace the bulky arms with thunder thighs, short height, wiry build, or any other insecurity that a girl may have, and you have the story of every girl’s shopping experience. But what if technology could replace the work of the confidante, and do it with greater precision? Believe you us, an app called Lily is already doing it! With emotional intelligence at its root, Lily understands women's perceptions of their bodies, and suggests clothes that make them feel their best. After opening the app, the user chats with Lily for a couple of minutes, with the latter asking questions to gauge the user's preferences and perceptions of her body. After analysing the woman’s thoughts, Lily matches her with styles that flatter her body. At Lily, the definition of emotion is the difference between reality and perception. When that gap is positive, there is confidence. And when that gap is negative, there is insecurity. And that's exactly what Lily has set out to solve. The app is the brainchild of Purva Gupta, who started her career as an early employee of fin-tech startup Eko Financial. After graduating from Indian School of Business, she got married and moved to the US in 2013. “I shopped all my life in Delhi markets when I could not afford the expensive brands I was buying in New York. After the excitement [of shopping high-street in New York] settled down, I started observing my own thought process, my own behaviour as I walked in and out of those stores,” she says. Gupta realised that the products were at the centre of the shopping experience while the shopper was the periphery. It didn't matter what shoppers thought of themselves. She started talking to women at Yale, where her husband was studying at the time, and asked them what made them gravitate towards certain products and styles. The answer was, women chose clothes that hid body parts they didn’t feel comfortable about and accentuated the ones they seemed confident about. Gupta started working on a product based on this insight. “From my experience at Eko, I knew whenever I was going to start up, I will build something of which I am the first user,” she says. “Women in America get at least get 13 negative thoughts about their body every day. I am sure this number is not very different in the rest of the world, maybe even higher. It doesn’t matter if you are size zero or size 22, every single woman feels something negative about her body,” said Gupta. 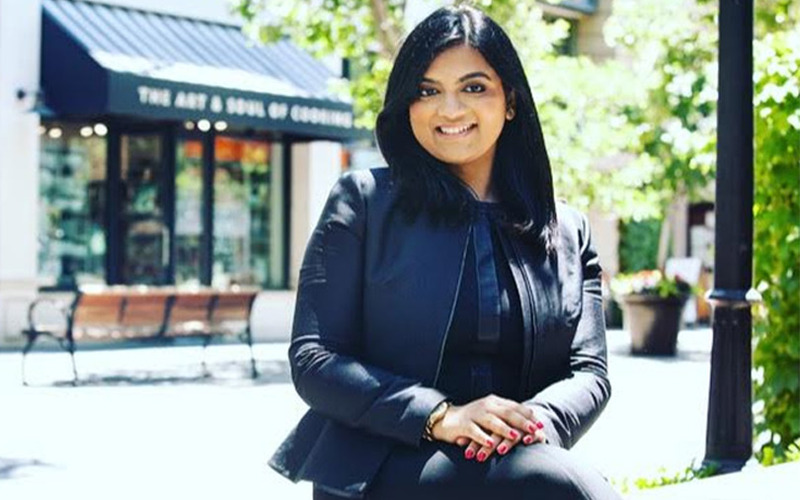 At the Founder Institute, an idea-stage accelerator in the San Francisco Bay Area, Gupta met her co-founder Sowmiya Chocka Narayanan. “She reached out to me for some mentoring on her idea; we ended up talking 10% about her idea and 90% about Lily. She connected with the problem and the vision very well, so we teamed up,” Gupta says. Narayanan, an alumnus of the University of Texas at Austin, had a 13-month son when she quit her job to start up, and has been instrumental in building deep technologies using emotional intelligence and deep learning, according to Gupta. Gupta finally started Lily in February 2015. Explaining the science behind the product, she says there is an objective way in which one can use cuts, colours and fabrics to impact a woman's looks. Lily’s styling algorithm is fed with millions of permutations and combinations of these three elements. “This objective science is what celebrities use to look different in every setting,” Gupta says. Besides, Lily’s feature-extraction engine understands products in depth. Any product, whether it's a trouser or a shirt, has a thousand attributes that technology can ascribe to it. “For example, if a 5'2'' woman feels she is short, and does not like maxi dresses, Lily will be able to figure that out during the chat and suggest products that create an impression of height,” Gupta explains. With every product that the user likes or dislikes, the self-learning algorithm keeps getting smarter. The Lily app, available only in the US right now, has on-boarded 26 leading retailers so far, including Nordstrom, Bloomingdale’s and Forever21, H&M, Banana Republic and Macy's. Before it spreads wings in South Asia, however, the company plans to capture the US market. Launched on the App Store just 14 weeks ago, Lily already claims to have nearly 4,000 users who have bought more than $100,000 worth of clothes. Proof of concept established, the app, which currently houses only tops and dresses, plans to enter more categories and sign up more retailers in a phased manner. “We are a team of five full-timers and a bunch of part-timers, whom we are looking to bring on board with the close of our seed round,” Gupta says. Lily users often share feedback that they like the app since it explains why a certain apparel will flatter them. And it's boring to shop elsewhere because the inputs are missing, they say.